Culture relates to nature (our biology and genetics) and nurture (our environment and surroundings that also shape our identities). “Culture” encompasses objects and symbols, the meaning given to those objects and symbols, and the norms, values, and beliefs that pervade social life. Values reflect an individual’s or society ‘s sense of right and wrong or what “ought” to be. Humans also have biological drives—hunger, thirst, need for sleep—whose unfulfillment can result in death. Because of our biology and genetics, we have a particular form and we have certain abilities. These set essential limits on the variety of activities that humans can express culture, but there is still enormous diversity in this expression. Culture refers to the way we understand ourselves as individuals and as members of society, including stories, religion, media, rituals, and even language itself. Social Darwinism was the belief that the closer a cultural group was to the normative Western European standards of behavior and appearance, the more evolved they were. Culture is the non-biological or social aspects of human life. Social Darwinism hinged on the belief that the closer cultural groups were to the normative Western European standards of behavior and appearance, the more evolved they were. culture: The beliefs, values, behavior, and material objects that constitute a people’s way of life. Human beings are biological creatures. We are composed of blood and bones and flesh. At the most basic level, our genes express themselves in physical characteristics, affecting bodily aspects such as skin tone and eye color. Yet, human beings are much more than our biology, and this is evident particularly in the way humans generate, and live within, complex cultures. Culture is a term used by social scientists, like anthropologists and sociologists, to encompass all the facets of human experience that extend beyond our physical fact. Culture refers to the way we understand ourselves both as individuals and as members of society, and includes stories, religion, media, rituals, and even language itself. It is critical to understand that the term culture does not describe a singular, fixed entity. Instead, it is a useful heuristic, or way of thinking, that can be very productive in understanding behavior. As a student of the social sciences, you should think of the word culture as a conceptual tool rather than as a uniform, static definition. Culture necessarily changes, and is changed by, a variety of interactions, with individuals, media, and technology, just to name a few. Culture is primarily an anthropological term. The field of anthropology emerged around the same time as Social Darwinism, in the late 19th and early 20th century. Social Darwinism was the belief that the closer a cultural group was to the normative, Western, European standards of behavior and appearance, the more evolved that group was. As a theory of the world, it was essentially a racist concept that persists in certain forms up to this day. If you have ever heard someone reference people of African descent as being from, or close to, the jungle, or the wilderness, you’ve encountered a type of coded language that is a modern incarnation of Social Darwinist thought. During the late 19th and early 20th century time period, the positivist school also emerged in sociological thought. One of the key figures in this school, Cesare Lombroso, studied the physical characteristics of prisoners, because he believed that he could find a biological basis for crime. Lombroso coined the term atavism to suggest that some individuals were throwbacks to a more bestial point in evolutionary history. Lombroso used this concept to claim that certain individuals were more weak-willed, and more prone to criminal activity, than their supposedly more evolved counterparts. In accordance with the hegemonic beliefs of the time, anthropologists first theorized culture as something that evolves in the same way biological organisms evolve. Just like biological evolution, cultural evolution was thought to be an adaptive system that produced unique results depending on location and historical moment. However, unlike biological evolution, culture can be intentionally taught and thus spread from one group of people to another. Initially, anthropologists believed that culture was a product of biological evolution, and that cultural evolution depended exclusively on physical conditions. Today’s anthropologists no longer believe it is this simple. Neither culture nor biology is solely responsible for the other. They interact in very complex ways, which biological anthropologists will be studying for years to come. 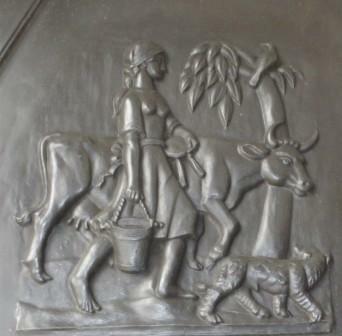 Guildford Cathedral relief (UK): People began domesticating cattle many years before they developed the genes for lactose tolerance.